The Presidency on Friday said it had begun moves to end the nationwide strike embarked upon by the Nigerian Labour Congress and organised Labour. The FG in a statement said a meeting had been called. 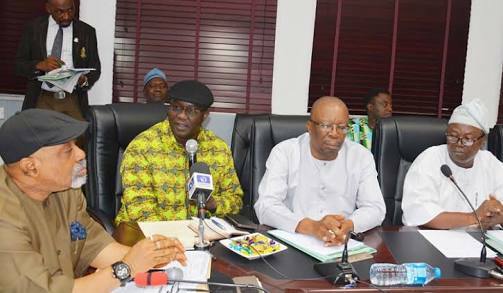 The NLC had on Wednesday directed all its members and affiliate unions to commence a nationwide strike on Thursday, following the failure of a meeting with the Minister of Labour and Employment, Dr Chris Ngige, in Abuja, to produce a positive result. Meanwhile, the strike entered its second day on Friday as banks, government offices, hospitals, schools, petrol stations, TV and radio stations, among others, were shut. In Ogun State, a correspondent observed as government offices and schools were shut, while a few banks operated skeletal services. At the Oke Mosan Secretariat in Abeokuta, the state capital, few civil servants were seen in some of the offices within the complex. In Ondo State, there was compliance with the NLC directive as government offices remained shut. Only two private TV stations were in operation in Akure, the state capital, as the government-owned radio and TV stations remained closed. However, when The Punch visited some of the government hospitals in Akure, it was observed that some skeletal works were going on, while it was gathered that only senior medical officers were allowed to enter into the facilities to perform some skeletal works. In Ibadan, Oyo State capital, the level of compliance with the NLC order was near total as banks were closed while civil servants stayed away from work. All schools, except privately-owned ones, were also closed. The NLC strike also took its toll on residents in the South-South as government facilities, as well as commercial banks, remained shut. A correspondent who monitored the situation on Friday in Edo State found out that some patients at the University of Benin Teaching Hospital, Benin City, had started leaving the facility for private hospitals due to strike by health workers. The state Chairman of the NLC, Mr Etim Ukpong, told The Punch the workers had been pushed to the wall, which was why the strike action was needed. The state Chairman of the Amalgamated Union of Public Corporations, Mr John Cebastine, also said he was happy about the level of compliance with the NLC directive by workers in the state. In Cross River and Bayelsa states, the situation was similar as public and private enterprises, including government offices, schools and financial institutions were closed to the public. The NLC Chairman in Cross River State, Mr John Ushie, said the union was on an enforcement drive to ensure total compliance. Ushie’s counterpart in Bayelsa State, Mr John Bipre-Ndiomu, appealed to the federal and state governments to make workers’ well-being a top priority so as to promote good governance in the country.